HILLSVILLE, Va. — Students, educators, churches and community members will build a new home on a foundation laid by organizers of the Greater Carroll County Chapter of the Fuller Center for Housing. Carroll County building trades teacher Rusty Warren, also an organizer of the local chapter of the Fuller Center for Housing, talks about how the excitement among students ultimately led to launching the housing assistance effort. Students will be an integral part of the local chapter’s activities, including building the home as part of their education in construction classes. Organizers had planned to do this work for the Habitat for Humanity, but decided that the Fuller Center was a better fit, explained Oliver McBride, the local chapter’s chairman, at a kickoff celebration held at Hillsville Christian Church last Thursday evening. The same man, Millard Fuller, founded both organizations. McBride learned of the Fuller Center when he experienced a "blitz build" of six new houses and repairs to an additional eight homes last year in Lanett, Ala. "I thought, well, maybe this is something that can work for us." The Fuller Center was founded on the same principals of Habitat’s mission — coordinating volunteer labor and using donated materials with the homeowner investing hundreds of hours of work in their new home, alongside others, he explained. It also renovates and repairs homes. This is important work as more than a billion people around the world live in substandard housing. As a result of the discovery of the Fuller Center, local organizers have signed an agreement and established a covenant partnership with the group, one of only four in Virginia, McBride said. The agreement required the local chapter to incorporate under the state of Virginia and become a 501 C3 non-profit organization, so donations will be tax-deductible. A 10-member board of directors has formed, and several subcommittees have the responsibilities of site selection and construction, family selection and coordination of volunteers, church relations and finances. "A lot of people have spent a lot of time getting this thing going," McBride said. "In order to accomplish the things we want to accomplish it will take a lot of us…"
Volunteers had raised about $25,000 while still working with Habitat for Humanity. "We’re extremely excited to say we have those resources to get started with," he said. The selected family will not be charged interest for the house, no profit will be made, McBride added. The monies that a family pays will give back and help other projects. Rusty Warren, a building trades teacher and vice chair of the new group, explained it was the students that got involved with the "house in a box" building efforts in 2006 in Roanoke, which eventually led to the creation of the Carroll County Fuller Center chapter. The students found it a tremendous experience, and they wanted to continue on with it on a local level, he explained. "Some of that student interest started growing, and some of the adults started getting involved, started looking into establishing a Habitat chapter here." Students are motivated to help, Warren said. The Skills USA Club at the high school raised $3,000 for the earthquake relief in Haiti — enough to build a house there. They were gratified that a private donor matched those funds to help rebuild in Haiti. "What’s missing in all this….. is this has all been outside of Carroll County," he said. "That’s what’s really exciting us and the students as we talk about this — that now we have the opportunity to help people in Carroll County, to help our neighbors." That work is ready to get started as the Carroll County High School building trades class has everything it needs to start building the first home as a modular unit, he explained. That work will take place in the field at the high school near the baseball diamond. Building the house will provide excellent educational opportunities for the students, plus it will get them involved in the community service aspect. A family has not been selected yet, but waiting for the right family would diminish the chances for the students to get the construction experience, Warren said. Students in the drafting class has already helped out by creating drawings of the house, before a nail has been driven. "I believe this is the first student-built house and the first modular house being built by a high school for the Fuller Center," he said. "I think we can really get some notoriety for our community and the efforts of our students through the fuller center with this, also." 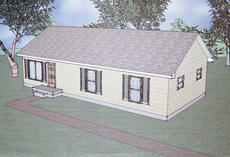 The planned house will be approximately 24 by 48 square feet with three bedrooms and low-maintenance features, he said. In addition to having the students work at the school, organizers will also schedule Saturdays or afternoons for community members to come in and assist with the progress. Warren said the home will be delivered to the site, modular-style, and finished out there. The chapter still needs a site for the house, McBride said. It would also gladly accept donations of material and labor. Any donations will help the chapter complete the first home and move on to another. Besides that, the Carroll chapter organizers also want to work on repairing homes — fixing a bathroom or putting a new roof on — for qualifying people who don’t have the ability to do it themselves. McBride said that organizers have decided to dedicate 10 percent of funds raised towards these "Greater Blessings" projects. Help us spread the word, McBride told the 30 or so people in attendance last Thursday. • For more information on the Fuller Center for Housing, call (276) 733-2385 or go to www.fullercenter.org/carrollcounty/hillsville.